Check ByteScout’s new hours tracker app with a simple and easy-to-go interface. It is already available at Gmail store and Google Chrome Store. The tool perfectly suits your browser and allows monitoring hours worked on various projects as well as calculating wages and more. So, what can ByteScout’s new timer app do for you? Lots of things, for example, keep your time records, export them into the spreadsheet, put client’s name and project details for reporting. You can smartly analyze and parse your exported data. 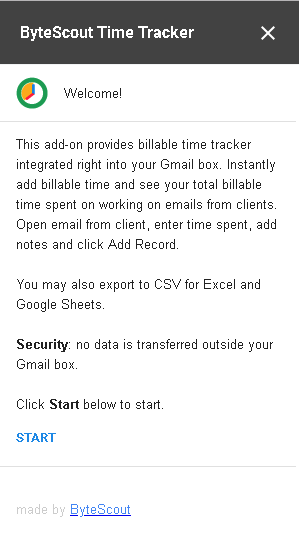 How to install Time Tracker for Gmail? Go to Gmail Store and Click “Install” button. After that, you will be asked to login to your account and accept ByteScout work time tracker. 2. Once done, you will see the plugin button in Gmail sidebar. 3. Now you can start and run project time tracking safely. 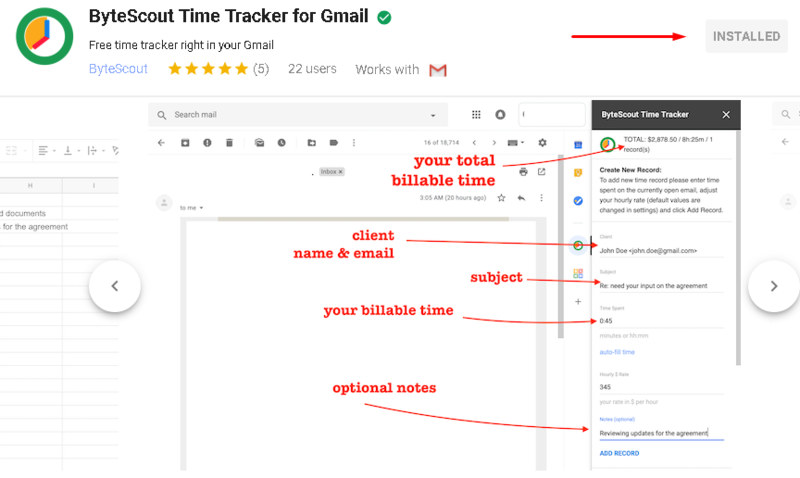 How to run Time Tracker for Gmail? So, right now you may easily track time and keep track of your work hours and wages with this one unique tool. To submit a new record, just enter your current hourly rate and time spent on a particular project. Automatically, the tool will fit information and client, email and subject from the email you look through when opening the time tracker app. By clicking auto-fill time, you will see the whole time currently spent on this project since it was started. It is done by the time tracking system. Simply Add Record or Change Settings. At the end of your working day/week/month (or any time you may need it), click on Export all Records to CSV. That is how you analyze hours tracked by ByteScout productivity tracker or send them to your client. 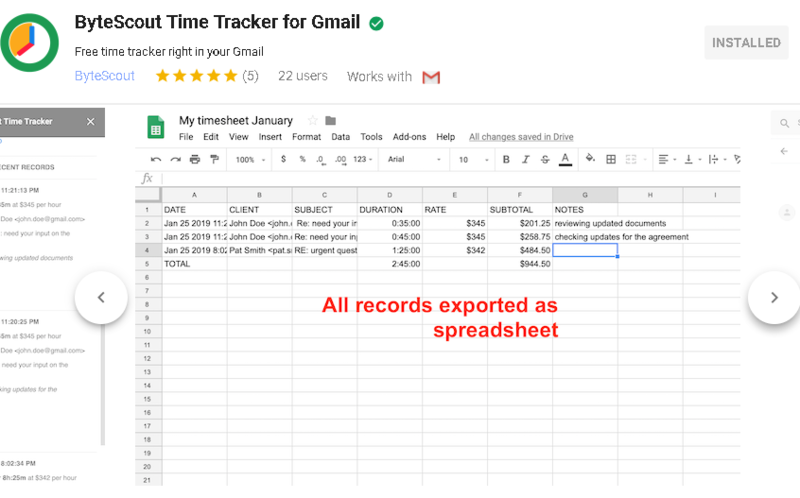 How to run Time Tracker for Google Docs? In order to test this timer app for Google Docs, you should just visit Google Chrome Store and install the app. After that, you will see it in the upper right corner along with other browser extensions. In this very comprehensive interface, you can proceed by adding a project and client names and any optional notes. The record will be added within a second. 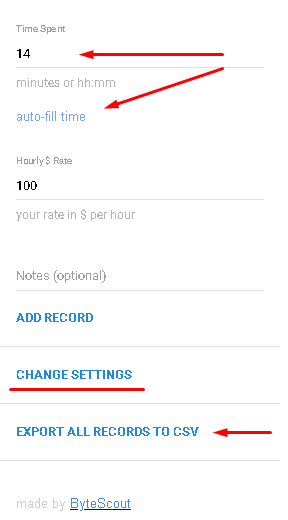 Modify the settings of the Google Chrome timer extension by clicking at Settings. Any time you hit the Add Record button -> the information about your current project time tracking will be stored inside the app. You may edit or remove it when needed. As the words imply, time tracking is the literal tracking of time for a specific purpose. Depending on the task in question, time tracking can occur in various inputs and methods. The most widely used time tracking table will register a number of hours and minutes. Other types of time tracking charts will save time in years, months or even generations. What is time tracking used for? Time tracking has gained a better foothold because of increased freelancing and need of correct and detailed logging of time. An independent worker should be able to keep track of the amount of time he has worked in order to invoice correctly and receive his or her due pay. Also, companies and businesses usually do employee time tracking for accurate and analyzable data. A company can determine if the project is developing on time or not by the use of time-based project tracker. They can also analyze the productivity and efficiency of their workers, determine if modifications should be made with project time tracking, and more. For any business, time is money and putting the time to good use is the best any leader can do. What are the benefits of hours time tracking? Most applications and free time tracking software can be used across multiple platforms, making it a versatile tool for cross-referencing, logging time, expenditure and more in an easy and efficient manner. Time tracking keeps invoices accurate and just. It is an easy to use tool that can be found for free. What are the different methods for time tracking? Finding a time tracking app is the simplest way. Just look for a popular and reliable application that goes well with your specific platform and download. Make sure to download an app that has what you need without unnecessary features added that will only occupy space. Simple time tracker apps can be found fast. The difference between software and an app to track work hours is slight. However, time tracking software is recommended for large businesses with central computing for easier tracking of time across their devices. Software must be downloaded onto each computer but will allow for a large database of time tracking possibilities. You can be your own hours tracker by manually keeping a record of time worked. However, this is only recommended for those with short work tasks at the end or if you are paid at the end of a finalized and approved project. Records should be neatly kept with date, a number of hours, and a brief description of what was done on that day. It is up to the contract in question if you must communicate with your employer daily or weekly about your progress.